Steve Razetti has wide-ranging experience of the Himalayan regions and a special affinity with the mountains of Pakistan. 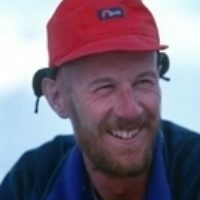 In May 1986 he joined Simon Yates and several other friends on a mountaineering expedition to the Hushe valley in the Karakoram. The following year he led his first trekking group in the area, taking a group to K2 base camp and Concordia with the legendary mountaineer Doug Scott. The people and mountains of Pakistan's wild northern areas made such an impression on him that he spent the next 16 summers there, only taking a break when the tragic events of 9/11 temporarily ended mountain travel in the country. He played an instrumental role in developing new and exciting routes for commercial trekking in Pakistan, exploring and leading reconnaissance trips throughout the Karakoram and Hindu Kush. His articles have appeared widely in the geographical and mountaineering press, and his photographic images are distributed by agencies such as Getty Images and the RGS Picture Library. He lives with his family in Cumbria.